Good question, but hang on. Before we answer your “The outlet with the buttons isn’t working, now what?” question, let’s give you a little background. First of all, your “outlet with the buttons” is called a GFCI outlet. 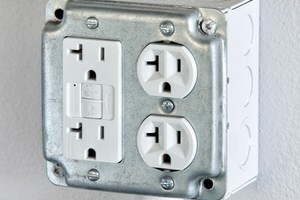 “A GF what now?” GFCI stands for Ground Fault Circuit Interrupter. You usually install these outlets where there’s water, like the bathroom, kitchen, basement, or outside. They protect you from electrical shock by–wait for it–detecting a ground fault and interrupting the circuit. It’s when an electrical path that’s not supposed to be there gets between a power source and a grounded surface. When that happens, shocks can result. We promise you we’re going to answer your question, but this stuff is important and one part is pretty shocking. See what we did there? Look at a normal 120-volt outlet (the kind you find in the United States) and you’ll see two vertical slots and a hole below them. The left slot is neutral, the right one is “hot,” and the hole is the ground. If that happens, you’ll be glad you have an “outlet with the buttons,” because it could save your life. A GFCI monitors the current flowing from hot to neutral. If there is an imbalance as small as 4 or 5 milliamps, it trips the circuit to stop the flow. It can do it in one-thirtieth of a second! And here’s the shocking part. It has to stop the flow of electricity that fast because, at around 10 milliamps, your muscles “freeze” from electrical overload. They freeze! So let’s say you’re holding a hair dryer and there’s a problem. Your muscles “freeze,” you can’t let go of the hair dryer, and you’re getting shocked. Two seconds later, you could be dead. If your outlet with the buttons or GFCI isn’t working, you probably had a problem with the electrical flow. The GFCI tripped the circuit to prevent you from getting shocked. First of all, when a GFCI pops, other outlets on the same circuit can stop working too. So, when you have a tripped GFCI in one room, test all the other CFGI outlets. It’s easy to do. Actually, we recommend you test your GFCI outlet monthly. Here’s how. The reset button should pop out. Plug something (like a hair dryer) into the outlet and turn it on. It shouldn’t work. If it doesn’t work, the GFCI is working properly and preventing electrocutions. If the hair dryer works, there’s something wrong and you may need to replace the GFCI. What if you push reset and your GFCI outlet still isn’t working? That usually means it wasn’t just tripped, it’s dead. How can you tell the difference? The reset button of a newer GFCI is designed not to catch hold if the outlet isn’t hooked up right. On the other hand, if the GFCI is just tripped, the button will catch hold for at least a split-second when you try to reset. If you reset your GFCI outlet and it still doesn’t work, it could be because the outlet itself went bad. They can literally burn out and stop working. If that happens, replace the outlet. Outlets can go bad for a whole variety of reasons. Sometimes they just need to be replaced. This could be a DIY job, but electrical work can be dangerous. You should probably call a professional electrician. If you need help replacing an outlet, or with any other electrical job, give Early Bird a call today. The general knowledge and advice in this blog is designed to give you a little background information about your electrical system and may not be complete or contain minor errors. Early Bird Electric is not responsible for any consequences if you attempt to fix your electrical problem using this information. It’s always a good idea to hire a local, licensed electrician like Early Bird Electric to safely and professionally handle the job.